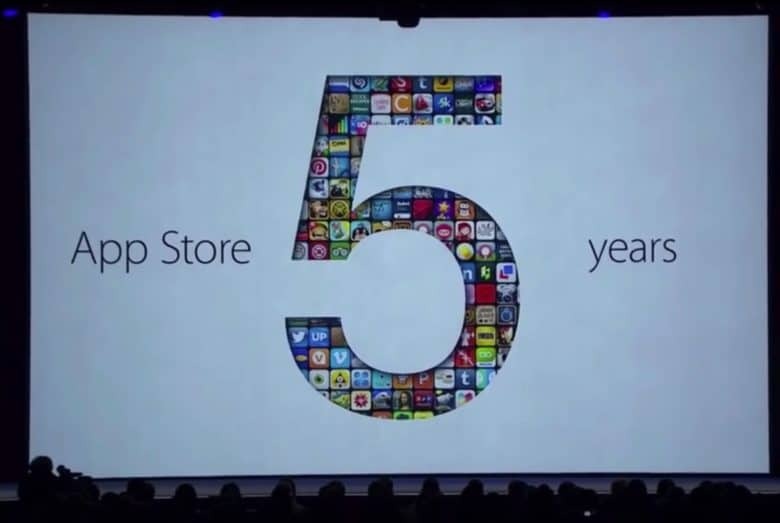 In its first five years, the App Store becomes an unstoppable money machine. June 10, 2013: Apple passes a major milestone in iOS history, as payments to app developers top $10 billion on the App Store’s fifth birthday. Speaking at WWDC 2013, Tim Cook reveals that Apple paid out half of this money in the previous year. He also notes that this outrageous total is three times more than all other app store platforms combined. With 575 million user accounts registered, Apple has more credit cards on file than any other company on the internet. People have downloaded 50 billion apps in total out of a collection of 900,000 available, Cook says, with 93 percent of the apps downloaded at least once every month. It’s an extraordinary success story for Apple. When the App Store opened its virtual doors in July 2008, it did not enjoy the company’s full support. Steve Jobs initially disliked the idea of letting users sully the iPhone by running non-Apple apps. However, he changed his mind when he realized there was money to be made. After that, the App Store went from strength to strength. By September 2008, it hit 100 million downloads. It reached 1 billion by April 2009. Apple, meanwhile, took home 30 percent of each app sold, giving the company another lucrative revenue stream. Here in 2018, the App Store is now 10 years old. At this year’s WWDC, Cook revealed that Apple has surpassed $100 billion paid out to developers. The App Store attracts 500 million visitors a week. And some 350 million apps written in Apple’s Swift programming language (which debuted at WWDC 2014) are available for download. Do you remember the very first app you ever downloaded from the iOS App Store? If you are an iOS developer, how has life changed for you over the past decade? Let us know your thoughts on the topic in the comments box below.